The 20-60x60mm Colorado Spotting Scope by Barska® is loaded with the brightness, clarity, power and waterproof/fogproof protection you need. Multi-coated optics provide excellent light gathering and the straight body design is comfortable for extended viewing. Perfect for viewing wildlife, birds, targets at the range, or even in a tree stand or blind. The Kit includes a compact tripod and soft carry case. 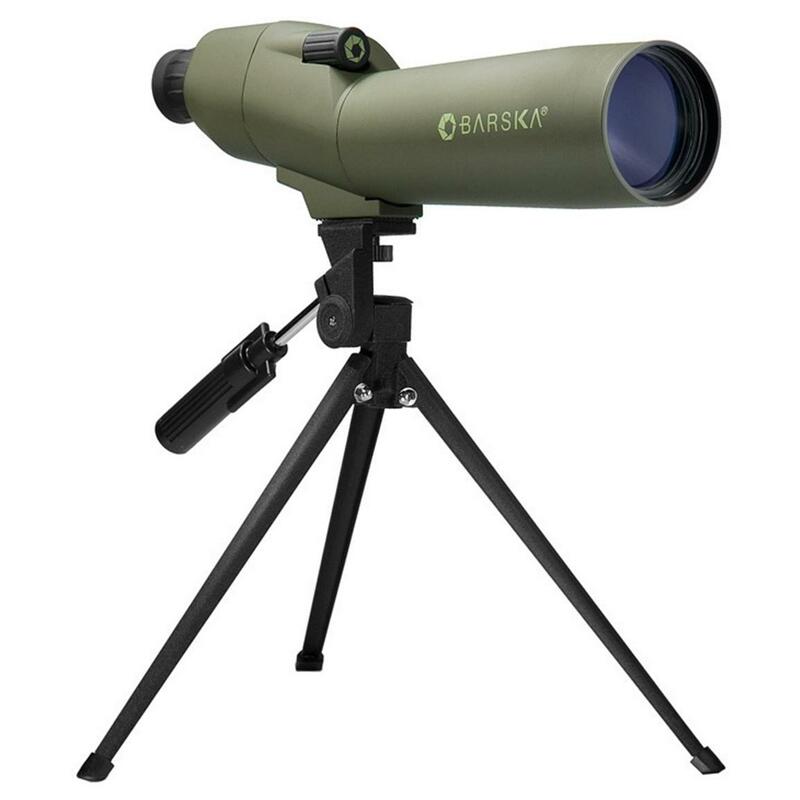 Barska 20-60x60mm Colorado Waterproof Fogproof Spotting Scope is rated 4.5 out of 5 by 6. Rated 4 out of 5 by celt from Great price for an adequate scope Hard to beat for the money. Great at the range. Field of view is limited. Rated 5 out of 5 by Eddie from It would be better if the caps were attached so they couldn't get lost. Rated 4 out of 5 by rusty from good product chose to stay mid price on a spotting scope. used at the range yesterday, worked as expected @ 100 yards . very light weight. would have given it 5 stars but focus was alittle fuzzy. all an all satisfied with scope,tripod and case. Rated 5 out of 5 by GlockGuyTx from BARSKA - Barska 20-60x60mm Colorado Waterproof Fogproof Spotting Scope This is a terrific spotter scope, especially at this price point. I wish it were colered black, but the optics are perfect for spotting your buddies shots. Rated 5 out of 5 by TIMOTHY from I have not had an opportunity to use the Barska Coloado 20-60x60 on the range yet. However, I have mounted it to the tripod to check the functionality of the scope looking across my ranch. At known distances, up to 800 yards due to terrain, it is easy to adjust power to bring an object close into view and then easy one finger adjustment to fine focus. 33.8' - 11.3' F.O.V. at 100 yds. Maximize precious pre-dawn and early evening opportunities! Maintain your accuracy even in fading light.